In this article, we’ll review various methods for accomplishing bulk data moving operations from one database to another. Connect to a source database via the Choose a data source step. Connect to a destination SQL Server database in the Choose a destination step. The -c switch specifies that the utility is being used with character data and that the -T switch states that this process will use a trusted connection, the Windows login credentials of the user that is currently logged. If the -T option is not specified a username and password must be specified with the -U and –P options. As would be expected, the destination table must exist prior to the import and the table must have the expected number and data types of columns to match the imported data. Select into cannot be used to create a new table on a remote SQL Server instance, but a remote source can be included in the Select statement, if there is a link to the remote instance. Any constraints, indexes, and triggers will not be transferred to the new table. Columns in the newly created table will not inherit the Identity property from the query output if the Select statement contains an aggregate function, a Join clause, or a Group by clause, and if an identity column is used in an expression, is used more than once, or is from a remote data source. 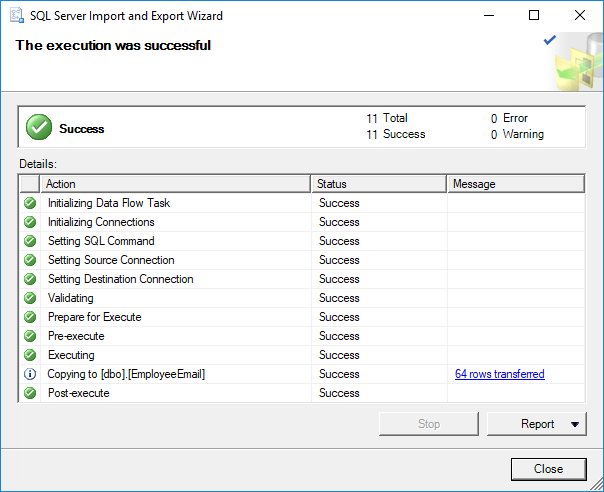 Using ApexSQL Script, a SQL Server data and schema scripting and migration tool, you can make a SQL script to export data, or both data and schemas, from a source instance and execute it on a destination instance to perform the import. ApexSQL Script can script objects, data or both. If both data and objects are scripted, in the Options tab, under the Structure section, assuming that a destination database exists, uncheck the Create database option and the Script use for database option. ApexSQL Data Diff is another useful tool for moving data. It is primarily designed as a comparison and synchronization tool, and as such it assumes that two tables, of similar structure, will exist in both databases. If a destination table already exists and it has the same structure as the source table, you can use ApexSQL Data Diff to migrate, import and export data. ApexSQL Data Diff is a SQL data compare tool that can compare and synchronize database tables but also copy data from one table or tables to a destination database table or tables, as we’ll demonstrate now.